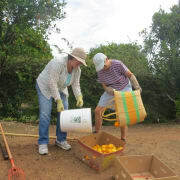 Need volunteers over 55 years of age to help pick and transport fruit in main population centers of San Diego County. Drivers needed to haul up to 300 pounds of food in their own vehicles for a distance of 20-30 miles from picking locations to warehouses and food distribution agencies. Most crews pick on Tuesday mornings. There is no minimum hourly requirement for volunteering, but most crew members participate on a regular basis. Some volunteers drive a Gleaner-owned van (or assist as sorters and loaders) to haul unsold groceries from supermarkets to warehouses. Senior Gleaners donates most of the fruit and food to the San Diego Food Bank and similar organizations. Good physical condition--able to walk on uneven ground, stretch and bend to pick fruit or load grocery items into a vehicle. Lifting 20-30 lbs. helpful but not mandatory.